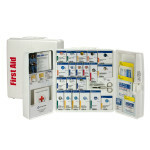 This 4-shelf, 1,060-piece industrial first aid station meets recommendations for businesses, offices and work sites. Serves up to 150 people. The swing-out door and easy-to-carry handle add extra convenience. * (1) M528: Antiseptic spray, 3 oz. * (1) M531: Burn spray, 3 oz. 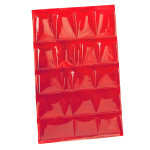 * (1) Eye wash, 4 oz. 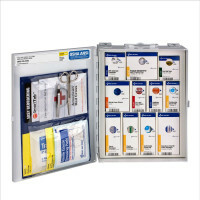 This kit meets ANSI z308.1-2009 specifications. 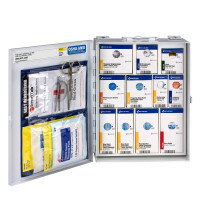 See NEW ANSI 2015 Kits. 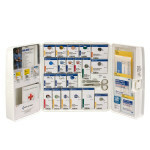 The First Aid Only® 4 Shelf Industrial First Aid Station - 150 Person.